Describing the Detective Garda as a genuine officer and “not a moaner whatsoever”, Mr Justice Tony O’Connor said there was no reason why such an award under the Garda Compensation Scheme should not equate to those awarded in other civil courts given the significant contribution by gardaí to the welfare and protection of society and the State. In November 2011, a detainee who was being photographed and fingerprinted, became extremely violent and struck the left hand of 39-year-old Detective Garda Daniel Treacy, causing severe pain. Detective Garda Treacy went to a hospital where he received pain-relieving medication, and his injured left middle finger was neighbour-strapped to his index finger. Detective Garda Treacy attended hospital again three days later, complaining of severe pain in his middle finger, and X-rays revealed a fracture at the base of his middle phalanx. His hand was placed in a splint, and thereafter he had persistent pain. In March 2012, the consultant in emergency medicine observed that Detective Garda Treacy had a ten-degree radial angle at the proximal inter-phalangeal joint, and that his active flexion was possible to 90 degrees only. At this point the fracture had healed, but he was very tender around that joint. Mr Justice O’Connor explained that Detective Garda Treacy was left with a set of fingers that cannot be fully clenched together, a misaligned hand when observed from the back, and that the finger is constantly cold. Mr Justice O’Connor said that the sensation of a throbbing finger persisted after seven years, and that the throbbing does not abate. The prognosis given by Dr Darragh Hynes, Orthopaedic and Limb Surgeon, was that the residual symptoms would continue, and Detective Garda Treacy would need to keep up stretching and other programs to minimise the effects of his injuries. Describing Detective Garda Treacy as a genuine officer, Mr Justice O’Connor said that he was “not a moaner whatsoever”, adding that despite having a two-year-old daughter he did not complain about its impact on his ability to lift and play with her. Counsel for the Minister for Public Expenditure and Reform cross-examined Detective Garda Treacy to indicate that after a further review by a consultant in April 2012, it took a number of years before he saw, Dr Hynes again in November 2015. By that time Detective Garda Treacy had attended multiple therapy sessions to regain strength in his finger. Mr Justice O’Connor said that Detective Garda Treacy could not be faulted for the delay in getting Medico-Legal Reports and processing the application under the Garda Síochána (Compensation) Acts 1945, since the system involved various officers signing off before an application gets a date for hearing. Considering submissions by Counsel for the Minister for Public Expenditure and Reform, who referred to Kampff v Minister for Public Expenditure and Reform  IEHC 371 (unreported), Mr Justice O’Connor said there was “nothing to suggest that the awarding of damages under this scheme differs from the process for other personal injury claims” and that he did not “divine” from the Court of Appeal’s judgments in Kampff or Seligman v Kuiatkowski  IEHC 102, that the Book of Quantum or High Court awards should be reduced by 45 per cent to 50 per cent in general. Mr Justice O’Connor was also satisfied that, considering the proportionality principle, the Court should not move beyond the cap of €450,000 when determining awards under the Garda Compensation Scheme. Mr Justice O’Connor said that moving to accept “average earnings” as a factor under the Garda Compensation Scheme for the awarding of general damages required “statutory intervention in the absence of established judgments of the Court of Appeal or the Supreme Court referencing such a factor for the awarding of all general damages”. 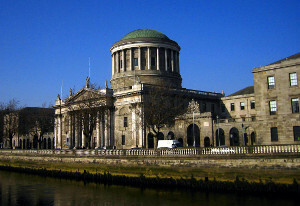 While accepting the reference to this in Sinnott v Quinnsworth  ILRM 523, Mr Justice O’Connor said it had to be stressed that in this case, the Supreme Court was reviewing an award by a jury for general damages of IR£800,000 (€1,015,790) plus very considerable special damages. Mr Justice O’Connor said that he consciously excluded the factor relating to average earnings. Counsel for Detective Garda Treacy referred to the “reasonable approach” taken by the President of the Circuit Court, Mr Justice Raymond Groarke, in awarding damages and for the type of injury here. Mr Justice O’Connor agreed with the band of damages cited, notwithstanding the “much lower figure” suggested by counsel for Counsel for the Minister for Public Expenditure and Reform. Stating that there was “no reason not to award damages to a member of An Garda Síochána under this scheme equal to the awards given in other civil courts”, Mr Justice O’Connor added “The Gardaí contribute significantly to the welfare and protection of society and the State. The statutory scheme under which this claim is made is just but one recognition of that contribution”.